Much to everyone’s disappointment, D23 Expo attendees and Star Wars fans were disappointed to hear nothing about the upcoming Star Wars Episode VII from Disney Chief Alan Horn. The exec reiterated information that we already knew, that J.J. Abrams is directing, that Michael Arndt is writing, and that John Williams will be conducting. So since the studio didn’t take the opportunity to make any announcements on their own stage, fans will have to be patient and wait it out. In the mean time, some juicy gossip regarding who may be returning for Episode VII has been rumored. If true, it could mean that Emperor Palpatine (played by Ian McDiarmid) could rise up and stir up some trouble within the force. The last several months have been up and down with movie rumors for the upcoming Star Wars Episode VII to be directed by J.J. Abrams. Among the most popular and seemingly solid rumors, is that several key cast members from the Original Trilogy will be reappearing in some scope. These, of course, are Mark Hamill as Luke Skywalker, Carrie Fisher as Princess Leia, and Harrison Ford as Han Solo. 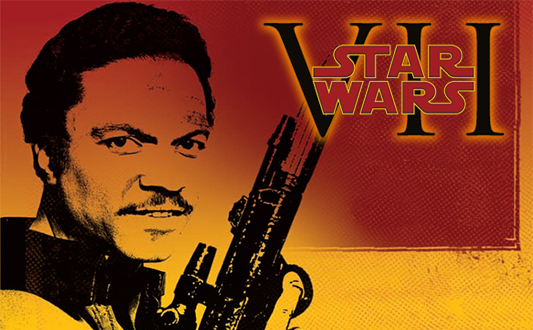 But what about everyone’s favorite gambling scoundrel, Lando Calrissian, as played by Billy Dee Williams? According to a Facebook message, Billy Dee Williams states that he has not up till now been contacted by anyone. In the recent flurry of rumors, it was said that George Lucas had met with Hamill, Fisher, Ford, and Ian McDiarmid (Emperor Palpatine) over several lunch meetings in 2012 to chew over the Sequel Trilogy. Williams, it seems, was not a part of these meetings, which would indicate that there may be no plans to have Lando even make a cameo in the upcoming trilogy.